Turkish Prime Minister Recep Tayyip Erdogan has said his country will sign a deal to establish diplomatic relations with Armenia on 10 October. Mr Erdogan said the deal would still need parliamentary approval in Turkey and Armenia after being signed by their foreign ministers. The two countries remain deeply divided over the fate Armenians suffered under Turkish Ottoman rule. A roadmap for normalising relations between them was agreed in April. Anticipation of a diplomatic breakthrough had been growing ahead of a planned visit by Armenian President Serge Sarkisian to Turkey on 14 October. He is due to attend the return leg of a World Cup qualifying football match between the two countries. Turkey has resisted widespread calls for it to recognise the mass killing of Armenians during World War I as an act of genocide. 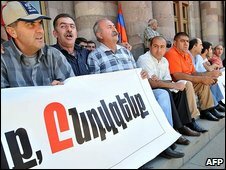 Armenia says 1.5 million people died. Turkey insists it was not genocide and that that figure is inflated.